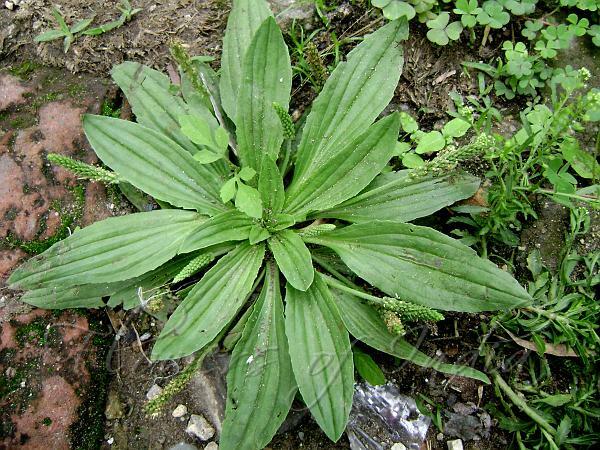 Asian Plantain is a perennial herb with leaves arising directly from root. 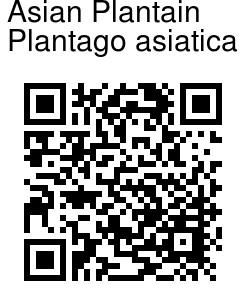 Leaves are all at the base, ovate-elliptic, 5-15 cm long, 3-8 cm wide, blunt, with several parallel nerves visible. Stalks can be as long as leaves, dilated at base. The stem carrying the flowers is 10-50 cm long. Flower spikes are solitary, densely many-flowered. Flowers are bisexual, small, not showy. Sepal-cup is 4-parted, and petals also 4. Stamens are 4, protruding out. Ovary is superior. Fruit is a capsule enclosed by sepal cup. Flowering: June-August.